I just got back from the 2012 Boston Wine Expo so I thought I'd post some pictures and thoughts for those who weren't there this year. Compared to prior years the two big changes I noticed were the layout and the mix of vendors. Rather than long aisles of tables, vendors were situated in clusters. Intermingled within these clusters were lifestyle vendors and - in a welcome addition - more food than I've seen at prior Expos. Where else to start off before noon on a Sunday but Chateauneuf-du-Pape? I don't recall seeing them last year but they seemed to be back with a concerted collective effort. I was pleasantly surprised to see them pouring wines from the highly anticipated (if young) 2010 vintage. 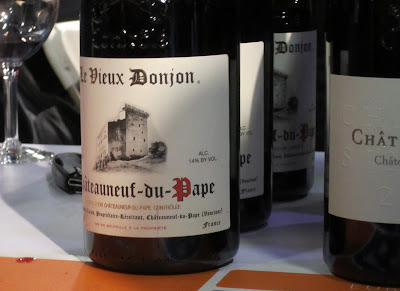 First taste was from one of my favorite producers: The 2010 Le Vieux Donjon Chateuneuf-du-Pape. They're one of the few wineries in Chateuneuf who retains a "One Estate, One Wine" model (rather than offering multiple bottlings at various price points. 75% Grenache, 15% Syrah, 5% Mourvedre, and 5% Cinsault. It was showing very well in its young with its signature round brambly flavors. Next was the 2010 Pierre Usseglio mon Aieul Chateuneuf-du-Pape. Although their entry level bottling (which runs for around $30 retail) is a blend, the mon Aieul (around $100) is 100% Grenache and more tannic than the Donjon. 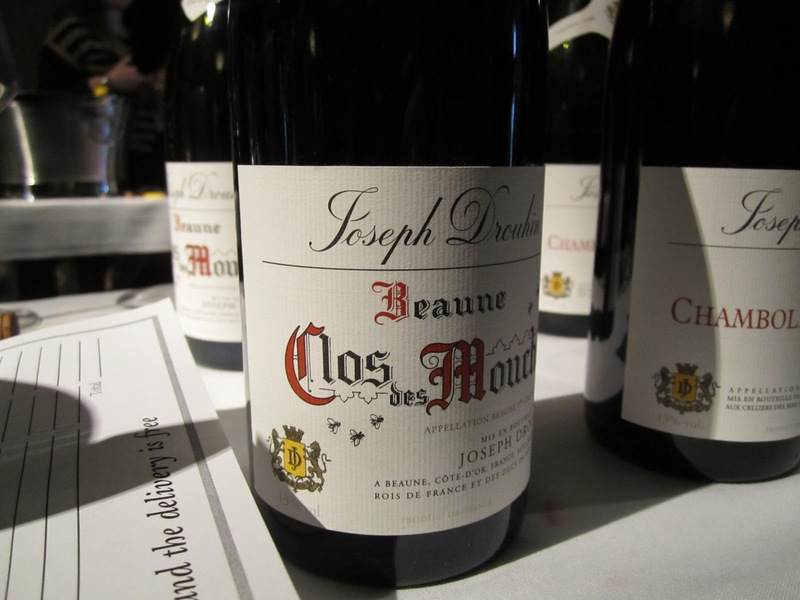 I asked the rep from Alain Junguenet selections for his thoughts on '07, '09 and '10 CdP. 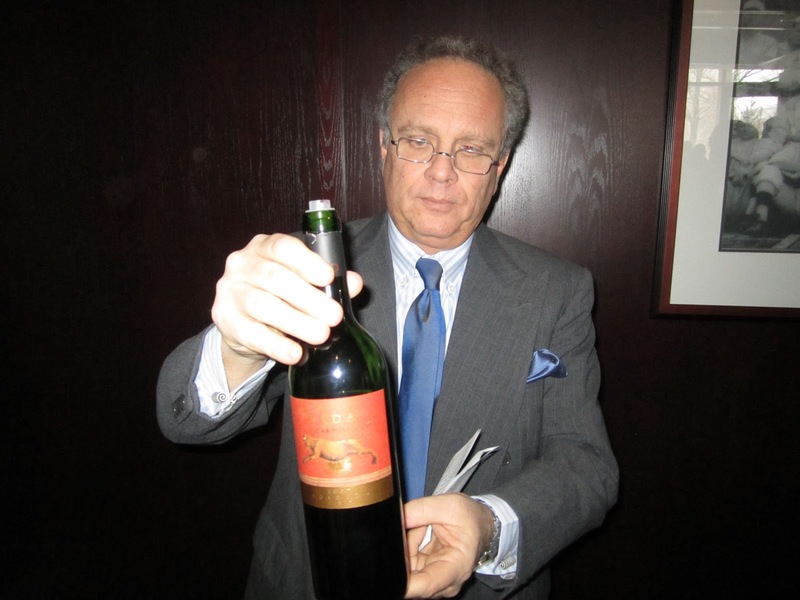 He agreed that '07 was a big ripe vintage, that '09 was tighter and needs more time, and that '10 was a "balanced" vintage. I'm looking forward to these '10s coming to market. Remember the interspersed food and lifestyle vendors I mentioned? 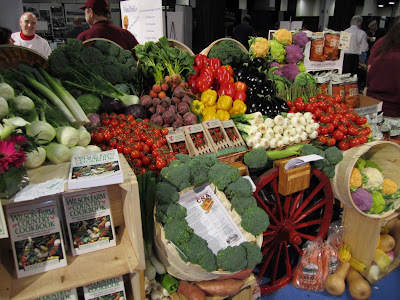 Here's a display from Wilson Farm from Lexington, MA - a great place to visit if you're in the Boston area. 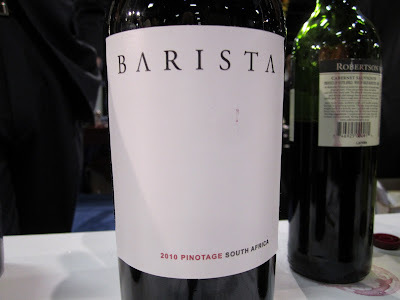 I'd recently read on 1WineDude.com about how people should stop hating on Pinotage. A few years back I was intrigued to try some Pinotage after reading that it commonly has coffee aromas and flavors. That sounded great to me but a few I tried had no such markers and instead smelled like quirky burnt rubber. This one did deliver the coffee though. Perhaps the name - Barista - was effective in subliminally programming me to expect some mocha. 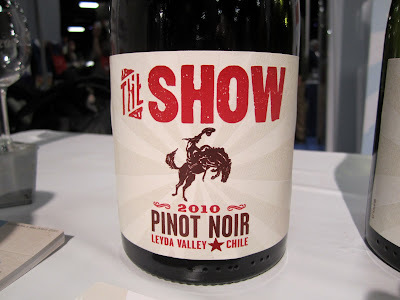 Here's an interesting new wine - the 2010 The Show Pinot Noir from Chile. The Show has been a trusty ~$10 wine for many so I was intrigued to try a Pinot Noir with the same label. 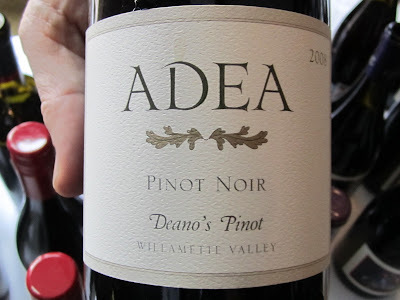 Not bad says this California Pinot Noir enthusiast. 85-88 for me as I give a barrel tasting-esque range given the expo format is hard to do critical tasting within. Similar to prior years half the tables were manned by winemakers/owners and the other half had random people pouring who didn't know anything about the wines. 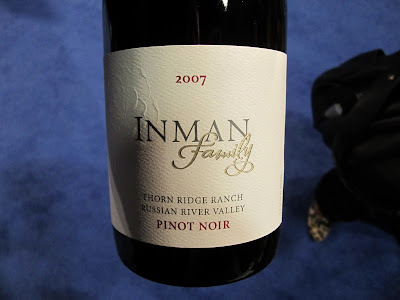 I had a nice visit with the principals from Inman Family pouring their highly regarded Pinot Noir. I thought the 2007 Inman Family Thorn Ridge Ranch Russian River Valley Pinot Noir was quite nice. They say they're patient in releasing their wines (some 2010 CA Pinot Noirs are already hitting the market). I like the approach of releasing wines when they're showing their best - with a little age on them - but I understand the interest wineries have in selling through vintages and paying the bills. Mixing things up a bit, we went over to a trade tasting at Morton's Seaport location hosted by Massachusetts-based Panther Distributing. They were pouring a diverse collection of wines from around the world. First up were wines from Sada Estate, poured by winemaker Davide Sada himself. An excellent 2010 Vermentino, an every day 2010 Integolo, and an elegant 2007 Carpoli Super Tuscan were highlights of the table. A new producer for me, from Washington, was Bergevin Lane Vineyards. 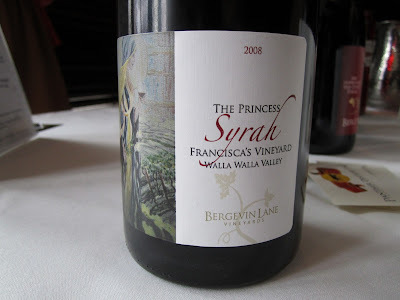 Their earthy, fruity Syrahs were impressive - especially the 2008 Bergevin Lane "The Princess" Syrah. 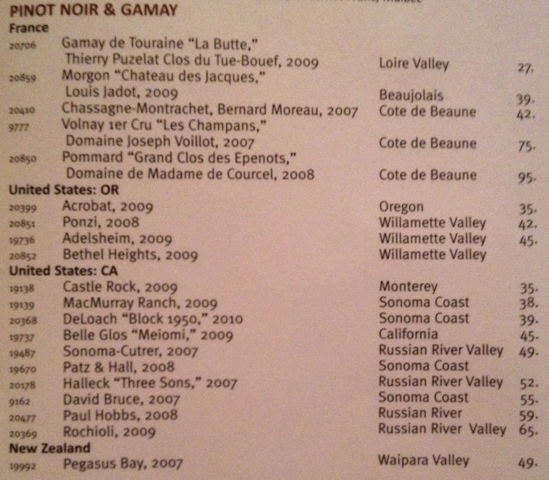 Oregon was also an area of emphasis at the Panther tasting. 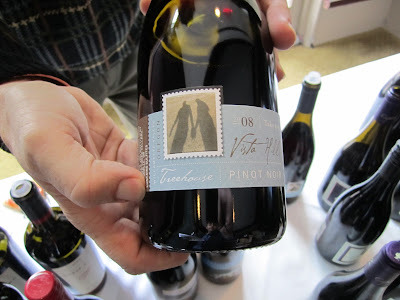 The 2008 Vista Hills Treehouse Pinot Noir was delightful and a bargain at just over $20 retail. Another Oregon Pinot that impressed me was the 2008 Adea Deano's Pinot. Very nice around $30. From there we went over to the Grand Cru Lounge which changed venues this year. Last year's Grand Cru Lounge was in a nice room with tons of windows, but the vendors were split up onto two levels and you had to go outside to get to the Lounge. This year it was accessible from the Seaport Hotel without going outside and the space was unified. First stop: Winderlea pouring their 2009 Winderlea Legacy Dundee Hills Pinot Noir. Unique bottle shape, cool label, and a very nice wine. We got to talking and I mentioned I was a wine blogger. 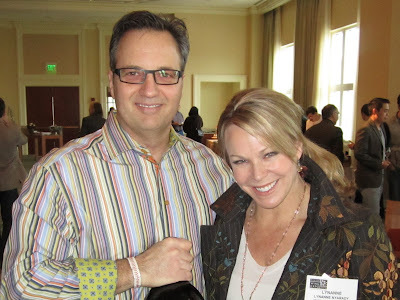 They're looking forward to the 2012 Wine Blogger's Conference coming to Portland this year. Me too! 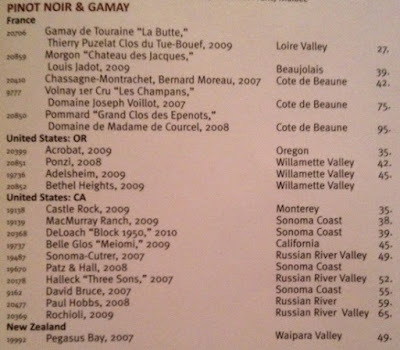 An interesting addition to the Grand Cru Lounge I didn't notice last year was a table pouring a bunch of high end California wines. Darioush, Heitz, Cakebread - stuff like that. 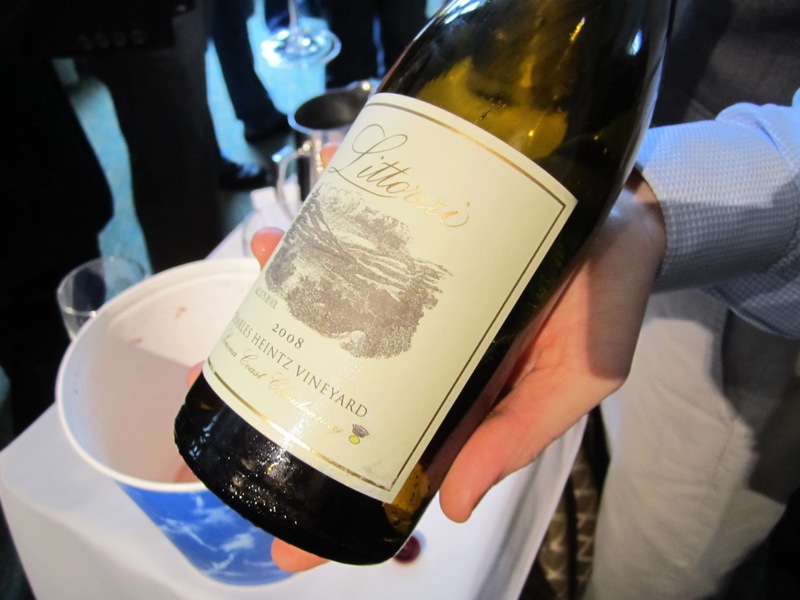 I tasted some 2008 Littorai Chardonnay that was gorgeous - clean and lemony yet rich. I've gotta track down some of their Pinot Noir. The food in the Grand Cru Lounge was pretty good. Especially these Spicy Tuna Tartare "Ice Cream" Cones from Union Bar & Grill. Fantastic. I've wanted to try Merry Edwards' Pinot Noir for a long time and the 2009 Merry Edwards Klopp Ranch Pinot Noir ($57) was outstanding. 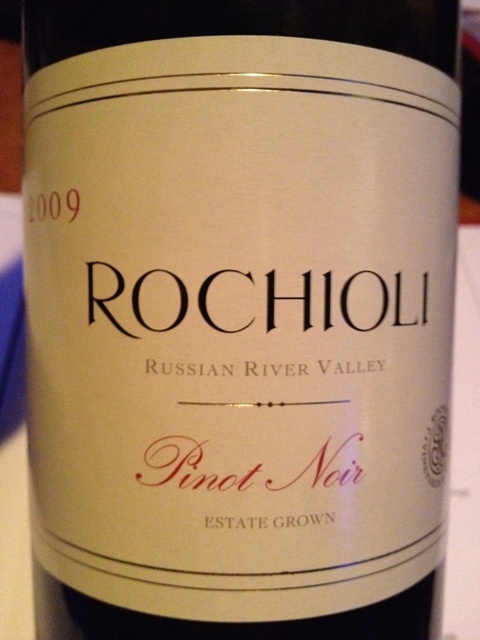 Classic Russian River Pinot. 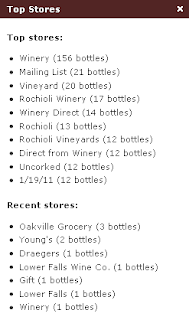 The winery rep suggested that if I liked the Klopp I'd probably like the more affordable RRV appellation bottling at $42. They also make a Sonoma Coast Pinot that sells for $38. Speaking of Pinot Noir, I was thrilled to see Trifecta pouring their 2008 Nyarady Family Russian River Valley Pinot Noir. 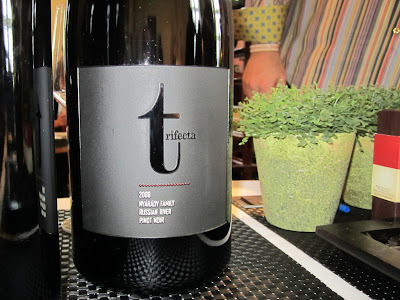 I discovered Trifecta at last year's Grand Cru Lounge and loved their 2007 Pinot Noir. The 2008 follows beautifully in its footsteps. Those familiar with Trifecta probably think of them primarily as a Cabernet Sauvignon producer. Their Cabs are fantastic (around $100). 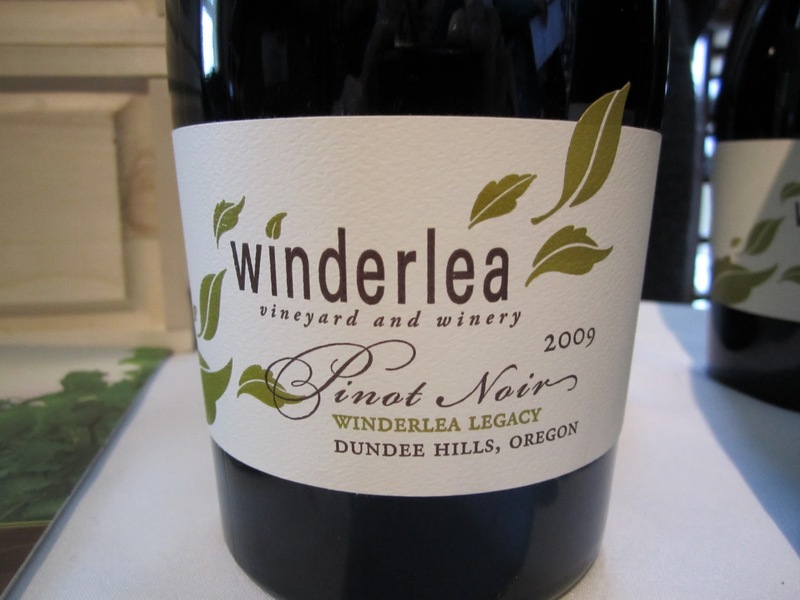 But I was pleased to learn they're giving Pinot Noir a go as well (around $50). Trifecta is owned by Massachusetts based Pablo and Lynanne Nyarady - two of the most delightful and interesting people I've met. Definitely check out their wines if you're looking for something special you may not have heard of before. They'll be pouring at the Nantucket Wine Festival and Newport Mansions Wine Festival as well this year. What a nice day - capped with a Patriots win and a trip to the Super Bowl. Question of the Day: Did you attend this year? If so, what did you notice? The first is from Groupon and offers $50 tickets for Sunday. The current price for Sunday is $85 so this represents a good last minute savings. You may recall the early bird Sunday price was $70 so in this case you can actually save a little by procrastinating. The second is a $25 off coupon code for Wine Spectator subscribers for the Grand Cru Lounge which reduces the price from $175 down to $150. I'm planning on attending the Expo Sunday so ping me on Twitter @RobertDwyer or drop me an email (wellesleywinepress@gmail.com) if you're going to be there. I'd love to say hello. Bytox Hangover Prevention Remedy: Might this thing actually work? Shortly before the holidays I received a sample of a few Bytox hangover prevention remedies. The product is a patch you apply before drinking and remove the morning after that, according to the manufacturer, supplies your body with vitamins and nutrients otherwise depleted while drinking thus preventing bothersome side effects commonly associated with the overconsumption of alcohol. Not wanting to risk a raging hangover myself, and not wanting to share my tales of overconsumption, I reached out to my friend George Kaplan who agreed to test the Bytox patch in a controlled experiment and share his thoughts for our collective consideration. He happens to be an excellent drinker. And as you'll find below, an equally excellent writer. I must admit, I was more than a bit skeptical when a friend of mine approached me with the opportunity to test the latest hangover remedy, bytox™. I am usually leery of these remedies, but with a full slate of holiday parties looming on my calendar, I decided I could use any help I could get. Before setting out for the evening, I thoroughly read the bytox™ directions, and chose to ignore the warning to “Stay well hydrated”. Sound advice, yes, but a bit of a cheat, as anyone who stays well hydrated is unlikely to end up with a hangover anyway. My evening’s consumption began at 7:00 with a solid meal at my favorite haunt, and ended at midnight. Per my custom, I mixed and matched and stuck to no pre-set pattern; the final tally was four Old Fashioneds (Old Overholt), three Gin & Tonics (Beefeater), and two bottles of Lone Star. As you all can imagine, I wasn’t exactly at my best the next morning. I did get up around five o’clock to have a glass of water and gobble down 800 mg of ibuprofen, but that’s my usual morning-after-a-debacle procedure, and I wanted to stick to it. You know, this being scientific and all. The bytox ™ did nothing at all to mitigate the day after lethargy, and I really fell off a cliff after two o’clock or so. But, skeptical though I was heading into this experiment, I must admit that the patch did help to alleviate some of the other, traditional “hangover” symptoms. The horrible metallic taste in my mouth was absent, as was the stabbing pain behind my eyes and the hollow feeling that one sometimes gets the morning after drinking too much whisky. I had only a small headache, and the day-after hangover fogginess was noticeably diminished. I would definitely use bytox ™ again. I don’t want to oversell this, of course; I was still banged up the next day, but I was able to function productively, rather than slumping senseless in a chair all day. What I did was excessive. If someone were to use this product because they usually have a little hangover after drinking a bottle of red wine the evening before, I’d hazard a guess that this handy patch would overcome the hangover altogether. So there you have it. An impartial review of the Bytox Hangover Remedy. Question of the Day: What do you think of the idea of a hangover prevention patch? What are some of your favorite hangover prevention tips? 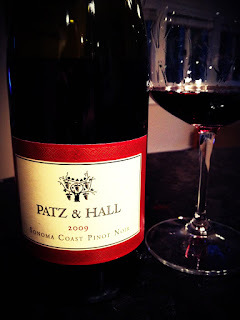 On Thursday, February 2nd Legal Seafoods is offering a 4-course wine dinner with Patz & Hall Winery owner Donald Patz. If you haven't been yet, this is an opportunity to visit their flagship Legal Harborside location which includes 3 levels of dining in an ambitious harborside dining mecca in Boston's Seaport District. 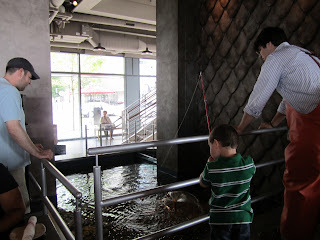 We visited Legal Harborside this past summer and were impressed. The first floor dining room offers casual dining similar to most Legal Seafoods and opens up nicely to the water in warmer months. 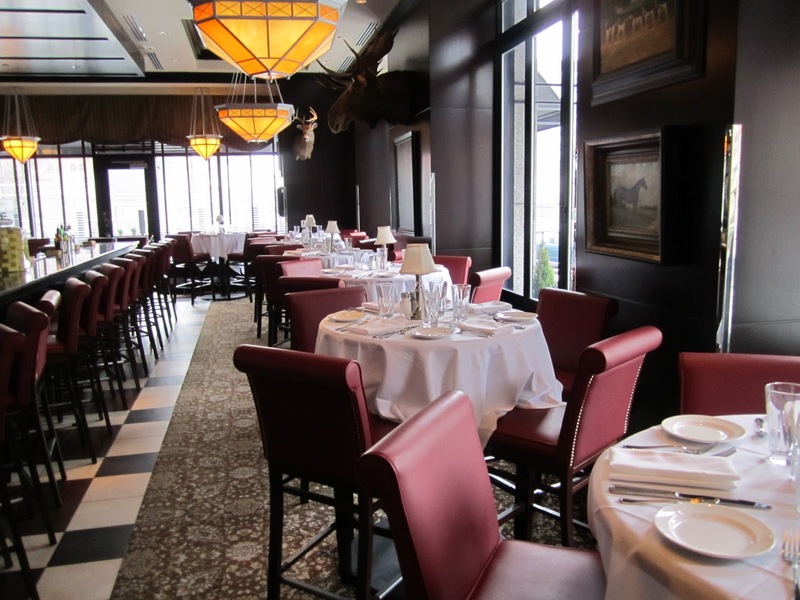 The second floor offers a more refined dining experience and is where this wine dinner is going to be held. The third floor is a ritzy club scene that wouldn't be out of place in Vegas. The location also includes a marketplace on the first floor as well as some unique features. 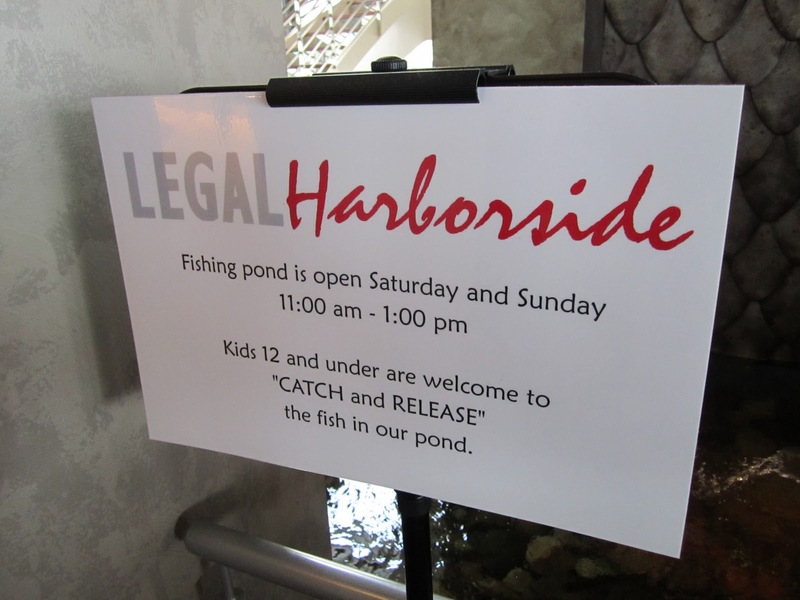 Like Catch and Release trout fishing right in the restaurant. Here I am with my 4 year old enjoying the program. I'm the guy on the left keeping my distance - you didn't think I'd touch the slimy fish did you? 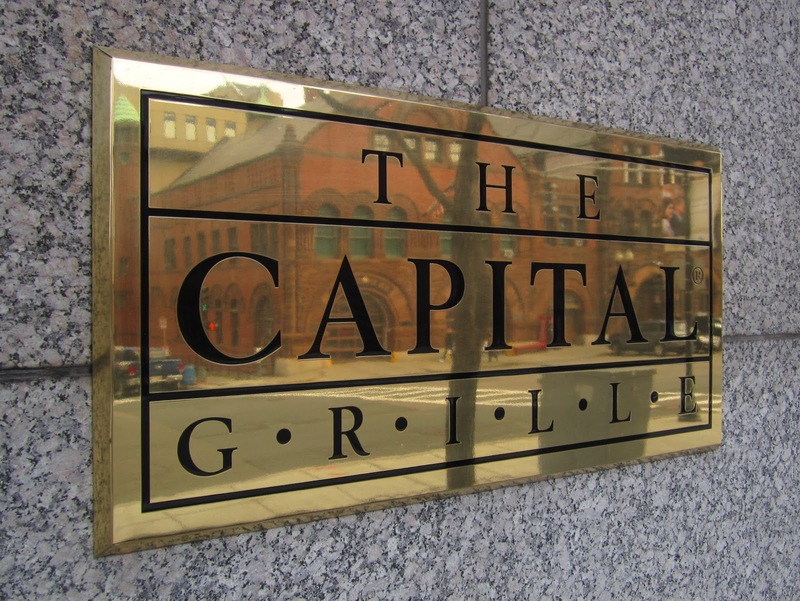 It seems like just yesterday, but The Capital Grille Boston moved from Newbury to Boylston Street this past August. I had my first look at the space when I stopped in for lunch with a friend recently. The new restaurant is grand - graciously proportioned, sophisticated, and comfortable. 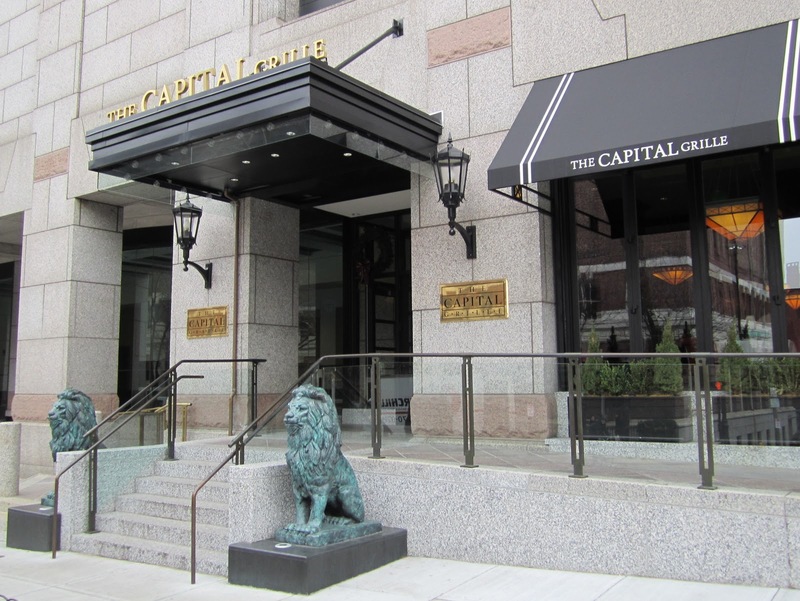 More than twice as large as the original, the location is now open for lunch, served primarily in a sleek lounge area with large windows overlooking the adjacent Boylston, Dalton and Hereford streets. I arrived shortly before they opened to take some photos of the space. The style is somewhat similar to the Burlington, Massachusetts Capital Grille but the build quality feels a touch higher at the downtown location. It also feels more spacious which is surprising given that this is a downtown location. Some familiar portraits convey from the old site, but this is very much a 100% new space. 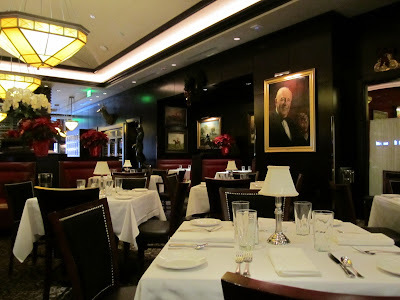 I was thinking I might miss the old restaurant with its ornate dark wood and good old boys club feel. But after a short walk around the room I felt right at home. 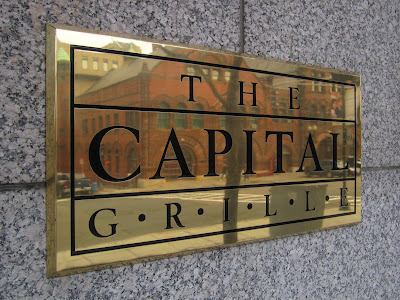 I can't wait to make it back for a birthday dinner. We took a seat in the lounge for lunch, as did most others that day. Seating near the bar in the old location was tight but this one is very comfortable. 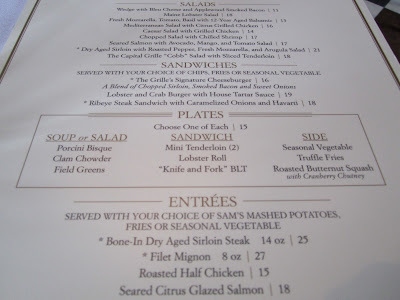 A "Plates" menu option provides a good value - a choice of soup or salad along with a protein and a side for $15. We split a wedge salad -- I feel cheated if I visit and don't get one -- along with selections from the Plates menu and a Tres Picos Garancha by the glass. I really want to try more Grenache in the coming year and this wine is a good example of why. Rich fruit flavors with caramel notes in the background. Quite affordable at retail too from around $12 (search for it at retail on wine-searcher.com). 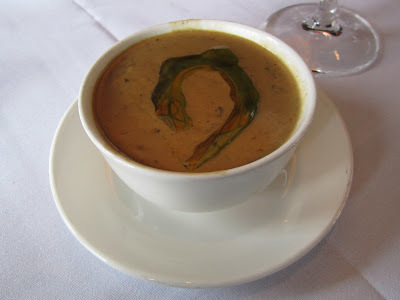 Our server and several others recommended the Porcini Bisque. I'm glad we took their advice - it was fantastic. It's a dark creamy soup served with a streak of chive oil. Mix that in and you've got a delicious hearty start to your meal. I couldn't pass up the Mini Tenderloin Sandwiches with Truffle Fries. Our server recommended the Lobster Roll or the "Knife and Fork" BLT but we couldn't be swayed. 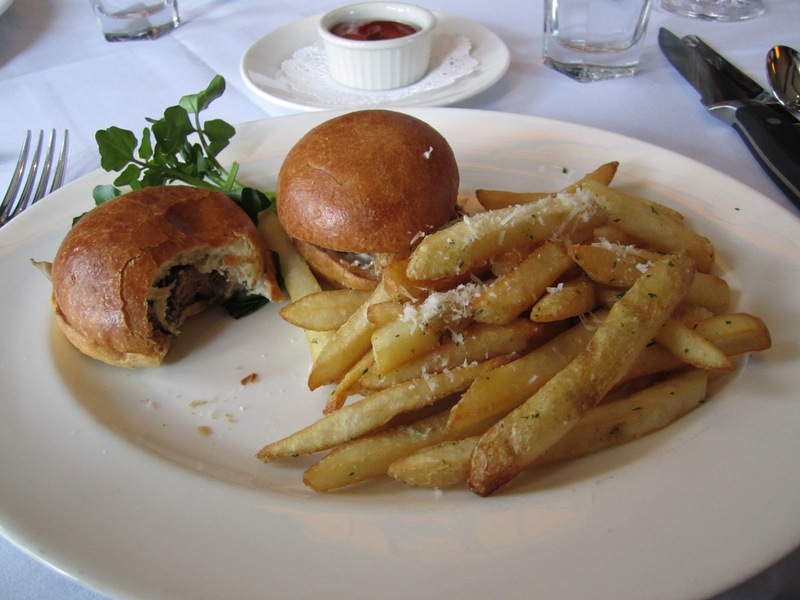 The tenderloin sliders were very good, but I've never been blown away by their truffle fries. Even if they sound and look delicious they're just so-so. I probably should have gone with one of the vegetable sides. 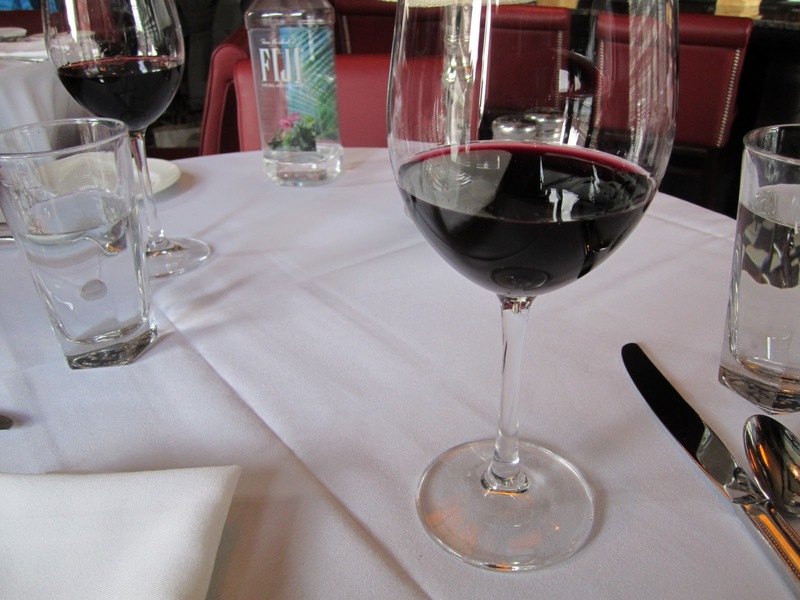 That said I enjoyed every bite, along with a wine off their higher end by-the-glass list: A 2010 Markham Pinot Noir that's unfortunately a Capital Grille exclusive. Highly recommended next time you stop in. The Plates menu is designed to get you in and out in 45 minutes. We must have lingered a little more than normal (we were on vacation) and ended up spending about 2 hours there. Note they don't have valet service at lunch. I was able to find nearby street parking (bring your quarters) but I hear the garage near the Kings bowling alley is a good option. The Plates menu evolves in early January to feature more wintery selections including -- get this -- a Wagyu Cheeseburger with Fried Egg and Crisp Onions. Last year I read Wine Politics: How Governments, Environmentalists, Mobsters, and Critics Influence the Wines We Drink by Tyler Colman. I really enjoyed it. It helps explain why interstate wine shipping laws are so fouled up. 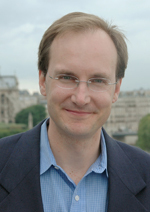 Tyler is known as Dr Vino on his wine blog where he usually writes in short form - but sometimes goes more in depth as he did with this piece exploring ethical standards at The Wine Advocate way back in 2009. One thing I appreciate about his writing is that it's always mindful of the acquisition process. He was in the Boston area for a visit recently so we were comparing notes on wine retailers. It was a good time to reach out to him for this 10 question interview. If you have a chance before you read this, get a better feel for his personality from his appearance on Wine Library TV. Q1: Dr Vino – what kind of PhD do you carry? Dr Vino: I got into wine writing the way so many people do, by doing a Ph.D. in Political Science. Q2: Wine that got you into wine? Dr Vino: There wasn't any one wine, just a lot of wines from different places--in an age of globalization and standardization around big brands, wine represents something distinctive, from a certain bend in a river, bottled at the source. It's so intellectually interesting, not to mention tasty, that it didn't take much to pique my interest. Q3: What kind of stemware do you use? Q4: If you could only buy wine from one retailer in the US for the rest of your life, who would it be and why? Dr Vino: Chambers Street Wines. They have a terrific selection, reasonable prices, and exert a tremendous influence on wine in America, one that belies their one small shop. 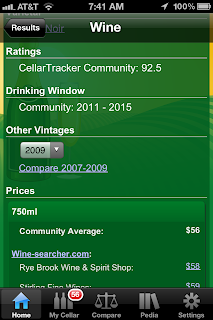 Q5: Best current release red wine value under $25? Q7: What grape variety is going to break through in the next 5 years? Q8: Instantaneous wine aerators: Fad or legitimate handy accessory? Dr Vino: I haven't tried one but I did just see the results of a recent blind tasting of NYC sommeliers -- they gave them the thumbs down. If I think a wine needs some air, I usually have time for a traditional decanter, which also showcase the wine beautifully on the table. Q9: If you could only drink one wine every night for the rest of your life, price a consideration, what would it be? Dr Vino: I couldn't do it! Part of the appeal of wine is that there are so many different wines out there and the seasons are always changing. Q10: Best tip for someone that’s just starting to go wine berserkers? Dr Vino: Try something new. Many states offer free tastings at shops--go and taste through everything. Have a wine themed party and challenge friends to bring different wines. My thanks to Tyler for answering these questions!